When news came out yesterday that a White-throated Robin had been caught and ringed at Hartlepool Headland and released at the Bowling Green, I was on Puffin Island at the time and strangely wasn't in the slightest bit bothered about going to see it. I think this was down to a couple of things: 1. I was in ringing mode, on one of the nicest places in Britain so wasn't up for an expensive train twitch, and 2. The initial text read '(not Red-flanked Bluetail)' which led me to believe that it must be a female as you surely couldn't mistake a male White-throated Robin for, well, ANYTHING! Tuesday morning came and I was planning on having a relaxing day off from a pretty hectic weekend's ringing. Chris rang me to say that Robin Sandham was getting ready to go for the bird and asked if we fancied it. Before long, I had my bag packed and a car full of Robin Sandham, Martin Jones, Chris Jones, Chris Bridge and myself were eastern bound with Hartlepool Headland set on the satnav! 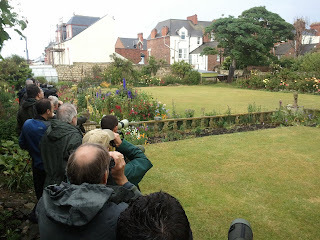 Arriving at Hartlepool at 5pm, it was pouring down with rain and there wasn't a birder in sight. Chris Bridge spotted a birder 'nipping' out of a garage door next to a large wall which I recognised from photos. We soon entered this very door and met a crowd of 25 people in the Doctor's garden. The bird appeared after about 2 minutes on a compost heap and then began feeding on the lawn. The photos do no justice for this bird as it is stunning in the flesh, filled with character. It was slightly too far for anything decent in terms of photography but I settled for a few record shots and very pleasing scope and bins views. The bird was identified in the hand as a 1st summer female which, according to Svensson, a 2y fem has light tips to a varying number of Primary Coverts, tertials or outer Greater Coverts. Primaries rather much worn, brownish....I couldn't see any of this in the field if I'm honest!